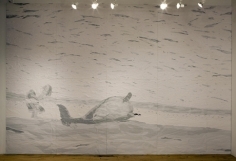 Foley Gallery is pleased to announce the first New York solo exhibition of artist Andrea Mastrovito. 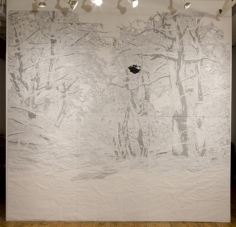 Andrea Mastrovito is known for creating large-scale installations primarily using cut paper. Mastrovito uses the most basic of two-dimensional materials to create three-dimension installations. 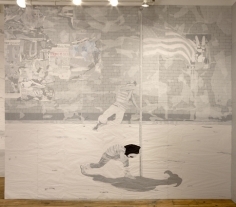 His monumental works are like interactive collages. 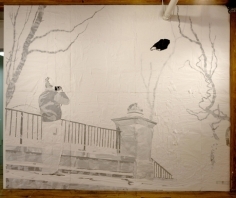 “Black Bag – American Philosophy of Composition” is a site specific installation composed of large tissue paper collages held together with thousands of pins. The subtle vibrations in these delicate two-dimensional panels trace every movement through the gallery. 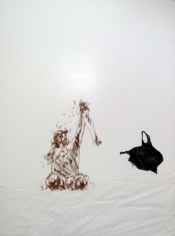 A single black plastic shopping bag appears in various scenes in each collage like a character in dream-like narratives. Like the glove in Max Klinger’s 1881 etchings “Ein Handschuh” (A Glove), Mastrovito’s black bag moves through a number of these surrealistic scenarios: it floats in the sea accidentally killing a whale, flies through the air being blown in the breeze and finds itself on the head of a little girl playing toreador while she thinks about Francisco Goya’s “Tauromaquia”. This single bag gently holds together each piece in this exhibition like the pins that hold together the tissue paper. Referencing Edgar Allen Poe’s essay “American Philosophy of Composition”, Mastrovito transfers Poe’s assertion about the need for transparency in the writing process and applies it to his own creative process. Quite literally, the tissue paper’s transparency and frailty does not hide any of Mastrovito’s creative processes or devices. Andrea Mastrovito lives and works in Bergamo, Italy. He has shown widely in Europe in public institutions and private galleries including the Palais des Expositions in Brussels, the Maxxi Museum in Rome, Analix Forever in Geneva, Biagiotti Progetto Arte in Florence and Antonio Colombo Arte Contemporanea in Milan. 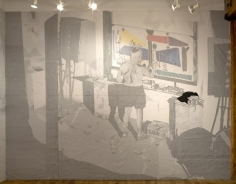 Andrea Mastrovito was included in the Prague Biennale in 2005 and is the current 2007 New York Prize fellow at the Italian Academy at Columbia University.